When many of us think of Italian wines, the first that spring to mind are hearty, food-friendly reds: Chianti and its Tuscan neighbors; Barolo and Barbaresco from the Northwest, and from down south, Primitivo from Puglia and the dark, intense Nero d’Avolas of Sicily. But Italy is rich with wine variety, perhaps more so than any other nation. We intend to highlight this happy reality this month, as our monthly Wine Focus on the WineLovers Discussion Group zeroes in on the rest of Italy’s vast wine cellar. So bring ’em on this month! Let’s compare, contrast and talk about the best of the rest, “light and white” Italian wines. The California Wine Club has extended their $1 Shipping Spring Wine Sale, but only until April 9, 2015. Stock up on handcrafted wines on sale for as low as $9.99. You’ll save up to $36 in shipping on every case. My first tasting report for the month features a light, snappy and aromatic white from Northern Italy, Ca’Rossa 2013 “Merica” Roero Arneis. To break that down a bit, it’s made from white Arneis grapes grown in the Roero region of Northwestern Italy’s Piemonte region. Although Piemonte is best known for big red wines made from Nebbiolo, Roero in particular has made the Arneis grape its own, bringing this ancient local variety back from the brink of extinction in recent years. You’ll find my tasting report below. 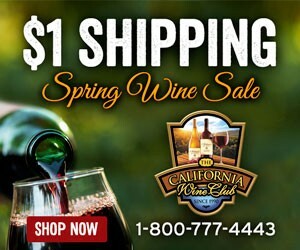 The California Wine Club has extended their $1 Shipping Spring Wine Sale, but only until April 9, 2015. Don’t miss your chance to treat yourself to the taste of delicious award-winning wines from California’s best small family wineries. Stock up on handcrafted wines on sale for as low as $9.99. You’ll save up to $36 in shipping on every case. WHEN TO DRINK: There’s no rush to drink it, but this kind of lighter white probably shows at its best when it’s young and fresh. VALUE: It’s a good quality white, not entirely out of line in the mid-teens in the current market. I’m hearing a lot of chapter about the shifting relationship between the dollar and the euro leading to lower prices for Euro-wines over the coming year, so keep an eye out. WEB LINKS This is producer Ca’Rossa’s website. It’s published in Italian and English, but appears to detect your location and deliver English pages to visitors from the U.S. or U.K. Unfortunately, Wine-Searcher.com is returning only Italian vendors for Dei Rosso di Montepulciano at this time. If you’d like to find the wine, though, bookmark this site and recheck it now and then, as the wine is moving into the U.S..